SweetLeaf and Sun-Maid are the Founding Members of Sugarwise. SweetLeaf Stevia Sweetener was the first stevia sweetener to receive GRAS status from the FDA and is the only stevia sweetener to win twenty-nine international awards for taste, innovation, and sustainability. They put their consumer first, and are serious about protecting the planet. SweetLeaf’s values revolve around making the world a sweeter place. Sun-Maid one of the world’s most iconic brands, established over 100 years ago in California, it is now the largest producer of raisins and dried fruits in the world. We are proud to have Stute and Streamline as Sugarwise Supporting members. Stute have made it their business to provide no sugar added jams and marmalades, so you can enjoy the finest fruit without the mountains of sugar. Look out for their products on supermarket shelves. All Stute preserves are Sugarwise certified. Streamline are manufacturing the very first Robinson’s Fruit Shoot bars, a great, no added sugar option for the family, for lunch boxes and for on the go snacking. Look out for their certified bars on shelf. Lo-Dough is a breakthrough low carb bread alternative which allows you to enjoy pizza, quiche, cake and kebabs all for a fraction of the calories. Lo-Dough is the first ever company to receive the ‘reduced carb’ certification from Sugarwise, highlighting it’s unique and innovative formulation. It’s also gluten free, high fibre, high protein, sugar free, and just 39 calories per piece. Enjoy the dishes you love, all without the refined carbs and free sugars. Tg teas are on a mission to change what we drink, for the better. Their green tea infused drinks are real brewed so offer authentic refreshment sip after sip. Now certified Sugarwise, these British bottled teas are green tea at its tastiest. First #Sugarwise RTD tea. Real Good Tomato Ketchup is gluten, nut and dairy free – and now Sugarwise certified, too! A delicious way to enjoy your favourite meals and stay Sugarwise. The Nowt Poncy Food Company is a proud northern brand specialising in healthy, low sugar cooking sauces. The Lancashire firm produces outstanding, low-calorie sauce for pasta and pizza, as well its very own vegan curry sauce, and a whole range of unusual pasta products. Nowt Poncy has now launched its own vegan range, including the vegan curry sauce, arrabbiata sauce, and tomato & basil sauce – all of which can be used in a number of different meal ideas. There is also a range which is gluten-free, vegetarian, and certified low sugar, giving you the freedom to enjoy good food with healthy, honest ingredients. Oppo Ice creams allow you to indulge in proper ice cream without compromising your health. They’re made with fresh cream, coconut milk and stevia and three flavours of their delicious range are Sugarwise certified reduced sugar. Free From Fellows make mouth-watering sweets without the sugar! They’re Sugarwise certified and are sure to satisfy even the most saccharine of sweet-tooths. Madame Sunshine make delicious sauces and chutneys that are dairy-free, gluten-free and a selection are now Sugarwise certified. Pick up a jar of Sugarwise jar of sunshine for yourself! Hangry snack Fruit, Oat, Nut & Seed bars contain natural hangry stabilising ingredients, hand rolled and pressed in England. Better yet, their Original Nutter and Cranky Cocoa bars are Sugarwise certified and sure to satisfy your appetite. Desi are passionate about bringing truly authentic Indian food to your home or restaurant in the most convenient way possible without compromise on taste or quality. They have a range of spice mixes and pastes that are Sugarwise approved and sure to liven up your mealtimes. Heavenly Tasty Organics is leading the way in 100% organic healthy snacking for babies and children, with a great range from wafers and waffles to bites and breadsticks. All of their products are Sugarwise certified and sure to be a hit with the kids. Stute produce a range of delicious no added sugar preserves, from Morello Cherry Jam to Thick Cut Orange Marmalade. Best of all, their entire range of no added sugar preserves are Sugarwise certified. LowGIcFood’s mission is to provide retailers with an affordable range of healthy retail products. The key focus is on reducing Sugar, Carbohydrates and increasing Protein in every day products like Drinks, Pasta, Sweets, Pastries and Cakes. Our vision is to work with the market place to provide a complete range of healthier products without compromising the taste or price. Romeo’s Bakery is London’s first Sugar Free and Gluten Free Bakery, providing a tasty range of certified Sugarwise Sugar Free and Gluten Free artisan cakes, pastries, quiches and breads, including Dairy Free and Vegan options. Plamil create dairy free and no added sugar Sugarwise chocolate. Plamil create their food in their factory which allows them to ensure great quality products. First #sugarwise chocolate bar. Stoffell’s sauces create savoury sauces such as tomato ketchup, brown sauce and tomato chilli ketchup. All of which are free from added sugar and use Stevia in order to add sweetness, which has no calories and doesn’t affect your blood sugar levels. First #sugarwise barbeque sauce and first #sugarwise tomato sauce. La Saucy Salsa is an Authentic Taste of Spain. Enjoy traditional recipes Andalusian style as a dip for tapas and fresh bread. Or relish them as they do in the Canaries drizzled appetizingly over your main meal, as a tasty accompaniment to almost any dish. All four of their salsas are #sugarwise, including Paprika, Coriander, Chilli & Garlic and Parsley. GymCrate is a monthly service delivering a selection of handpicked supplements, snacks and health products straight to your door. These have been carefully selected to ensure customers are kept up to date with the latest supplements and health products in the market today. Zoot create guilt free bars for you to snack on, their mission is to ensure that everyone who snacks can do so in a healthy way that suits their lifestyle. They’ve created snack bars with great flavours including Cashew Supreme, Brazil nut carnival, and Zoot milk and dark chocolate. Four are now #sugarwise. Diablo create great no added sugar treats including chocolate bars, cookies, sweets and muesli bar. So you can treat yourself without feeling devilish. Check out Squirrel sisters and their great range of snack bars, including cacao brownie, cacao orange, coconut cashew and raspberry ripple all of which are now Sugarwise! Proper nutritious food for kids to enjoy. Little Dish make a wide range of great tasting healthy meals for 1 to 6 year olds. With ravioli, spaghetti and meatballs and even pizzas, little Dish provides great tasting healthy food for your kids to enjoy. Savorini specialised in manufacturing prime agri-food. We’ve certified their argan and almond spread which tastes great. Instant noodles that are good for you! Mr lees noodles are 100% tasty and 0% nasty, with 6 different tasty variations there’s lots to try. They’re gluten free with nothing artificial and are Sugarwise. Healthy no added sugar baby food that gives your children nutritious interesting food for them to munch on. Babease give you and your family the most flavour packed food possible for your kids to enjoy. Foodforlife create wholesome great tasting, healthy bread, buns, cereals, pasta, pocket breads, tortillas and waffles. As well as being low carb Atkins foods are also Sugarwise. With a wide range of products ranging from Chocolate fudge bar and cookies and cream bar to their chocolate and strawberry drink. Smootheelicious create great tasting smoothies for you to make at home, with great flavours such as pineapple, strawberry & coconut and Peach, passion fruit & mango. All of which will get your taste buds moving! A range of all natural zero calorie sugar alternatives, whole food flours and low-carb, sugar and gluten-free easy-to-bake mixes. Nutri-Nick are offering an alternative to the mainstream with their no added sugar bars, pasta, hot chocolate mix and stevia sweetening drops. Nut Butters with no added artificial flavouring, colouring, emulsifiers or fillers that are Sugarwise! All made from the best nuts and seeds available. Nomad health’s natural pastas are Sugarwise and gluten free. Nomad health help you stick to your paleo diet with pastas made from flaxseed, green banana, sesame and more. sáile create healthy seaweed infused snacks, including their organic synergy ball mix which is Sugarwise! Using Atlantic seaweed and pure organic ingredients. Free’ist’s large range of scrumptious sugar free products are all Sugarwise certified. With a huge range including popcorn to chocolate and Jams and more! So you can get your sweet fix from your favourite snacks without the sugar. All three of Nut Blends roasted almond and hazelnut butters are all Sugarwise! With natural sweetness designed to satisfy your cravings and provide wholesome energy. Nut Blend only use roasted almonds and hazelnuts, organics raw cacao powder, organic hemp protein powder and natural spices to provide maximum taste. Great tasting, all-natural and Sugarwise falafel. London Falafels Vegetarian and vegan are simply vegetables, herbs and spices, giving you a brilliant natural taste. Perfectly Clear is an independent and dynamic branded soft drinks business. They produce leading sugar free beverages that taste great and are Sugarwise certified. Through years of experimenting with recipes in her home kitchen, Farzana (Founder of Treat – guiltfree essentials) has created recipes which omit unhealthy sugars, starches and gums and are low carb, low GI, gluten free, dairy free. We specialise in low carb bread mixes. Other products such as cakes, breads, and cookies can be found on our website. Delicious and guilt-free no added sugar chocolate bars and spreads sweetened with Stevia. Pundits products are handmade in Britain and only ethically sourced ingredients are used in their Sugarwise Certified products. Enjoyable for all without compromising on taste! Mason’s Beans are an industry first, they create fresh baked beans in multiple flavours with no added sugar. They now have three Sugarwise certified products including Real Tomato, Bacon & Mustard, and Smoked Chilli. The products were featured on Dragon’s Den and gained investment from Nick Jenkins. First #sugarwise baked beans. Vieve is a hydrating protein top-up, for busy, active people on the go. Vieve has a refreshing taste with no added sugars. With over 20g of protein per drink, it differentiates itself from other protein drinks by being water-based and not powdery or milky. Taste by Fusion is a delicious jam with unique, exciting blends. It contains no added sugar, is all natural, with Superfood ingredients. Nasty colourings and preservatives have no place in our jams! They prepare their fruit spreads with at least 75g of whole fruit per 100g. PHROOTI is made by infusing real fruit in spring water and isn’t sweetened at all, so it tastes refreshingly fruity. With less and 2g of sugar per 100ml and less than 30 calories per bottle it is a delicious, healthy way to hydrate. The Jam Goddess makes premium hand-made jams, totally delicious and free from refined sugar. Corina Maeting’s family have been making jams since 1896 so jam-making is in her blood! She developed her own jam recipes containing fruits, stevia and chia seeds, and no refined sugar. Her jams are completely guilt-free and innocently indulgent at less than 5% free sugar. Zollipops, Zolli Drops and Zaffi Taffy are the delicious, clean-teeth sweets that help reduce acidity and strengthen tooth enamel. Loved by Moms, teachers and dentists, these tasty sugar-free treats with Erythritol and Xylitol were created by 12-year old kidpreneur Alina Morse, and will keep everyone smiling for years to come. 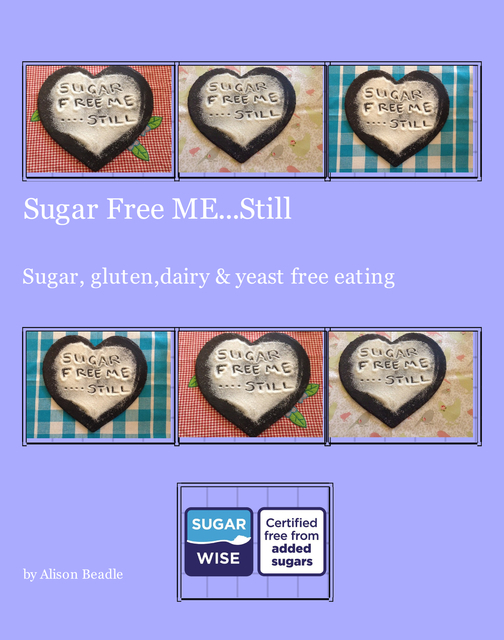 Alison Beadle’s 2nd sugar, gluten, dairy and yeast free recipe book really is the next step up from Sugar Free ME. Delicious sweet and savoury recipes which range from soup to profiteroles. All tried and tested on sugar eating friends and family so not just her taste. The first book of its kind to be certified as ‘No Added Sugar’ by Sugarwise the global sugar awareness benchmark. All recipes are low in all sugars including fruit sugars.